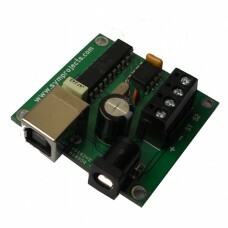 The Rev Burner is a USB board that will allow you to connect a real rev counter to the computer, using the USB port. On after-market rev counters, the number of engine's cylinders can be set with a switch on the back of the gauge. Please not that rev counters for diesel engines a re not supported. The Rev Burner requires a 12V power supply (switching, also known as regulated). Power supplies are available with European, US or UK plugs. In case you already have a power supply available, the power socket mounted on the Rev Burner board requires a power plug with these dimensions: 5.5mm/2.1mm (outer and inner diameters). The center pin of the power plug is the positive. A compatible power plug is available in the shop. Start SimDash and on the main screen click the Configure button for the Rev Burner plugin. Click the Import button and select the correct profile for your rev counter. The profiles are located in the SimDash\Profiles folder, in the SimDash installation folder. Choose the profile file with the name that matches the type of rev counter you have. For example, you have a 11000 RPM rev counter, select the file Settings-11000-RPM.xml. The grid in the centre of the form will be populated with the correct values of pulses per minute (PPM) for your rev counter. The first column contains a percentage and the second column the number of pulses sent to the rev counter every minute. Check the rev counter and the power supply are connected to the board. Use an USB cable to connect the board to the PC USB port. When you click the Test button of the row with the value 20% in the first column, the needle of the gauge is suppose to move to 11000*20%= 2200 RPM. If you find your rev counter is not accurate, for example clicking the Test button in the 50% row the dial moves to 5300 instead of 5500 RPM, move the slider to the left or to the right until the rev counter displays 5500 RPM. If you need to make small changes, use the up and down arrows, at the right of the PPM value, instead of the slider. In the Other settings section, type the max RPM value of your gauge. Click OK to save the settings and close the form. The 12V wire: usually its colour is RED and carries a 12V voltage to power the rev counter. It does not power the light of the rev counter. In a real car it would be connected to the ignition switch but we connect it to the + terminal of the board. The ground wire: it is BLACK and it should be connected to the battery ground. We connect it to the terminal with the – . The coil wire is usually BLUE and should be connected to the ignition coil. This wire carries the information about the engine rotation speed. It must be connected to the S1 terminal. Another wire for the 12V which is usually connected to the light switch of the car. I found this cable is often WHITE or YELLOW. Connect it to the + terminal, together with the RED wire seen previously. You may have a second ground cable. If present it is BLACK. Connect it to the – terminal.